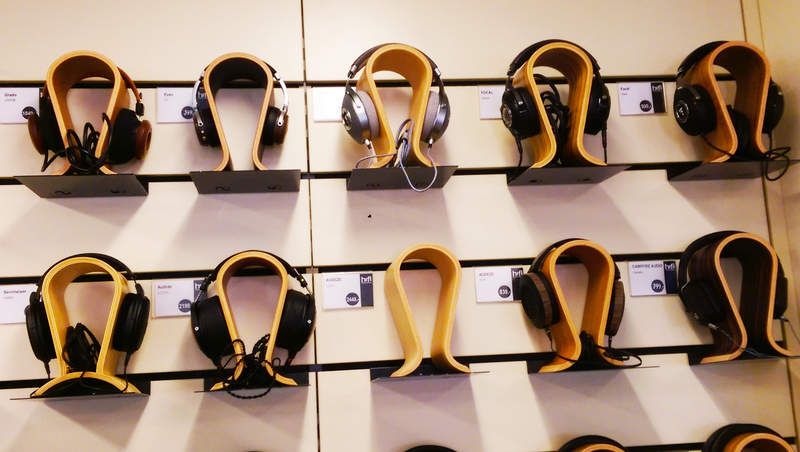 After my recent foray into headphones with the Focal Utopia, I went down to the local store to try out various headphones. To get a feel for the properties of the Burson V2 amp I would be listening with, I started with the familiar Utopia as baseline for my impressions. I already enjoyed Utopia when listening from my SP1000 Cu, so was curious to see how feeding it more power would affect its performance. Indeed, increasing the power improved the control of the mid-bass, which benefits the airiness of the stage, and accordingly, its separation. The quicker decay of the mid-bass results in a more neutral tone, and cleaner sound. As a result, Utopia sounds tighter, but also starts to predominantly lean towards the technical over the musical, gaining a more analytical character. The combo sounds stimulating and highly detailed, but also somewhat clinical in tone. The 10 KHz peak that was initially somewhat smoothed out by the A&K, starts to pop its head out more frequently. So while there is a noticeable improvement in performance, I still prefer the synergy with the A&K despite its lack of power. The blend of warm and bright results in a more euphoric character, compared to when mixing neutral with bright. Overall, the Burson V2 can be characterised by an especially neutral tone and clean sound, where my preference would require an additional touch of warmth as prerequisite for a more natural tonality. My initial plan to head over was to try the Audeze LCD-3, as multiple people had told me I should try or even own it once in my lifetime. But when I arrived I was tragically informed it had just been sold a few days earlier. Yearning for that trademark Audeze naturalness, I settled for the ‘next best thing’; the closed LCD-XC. The Audeze instantly greets with you with its forward mid-bass, the power down low driving the sound. When called upon, its emphasis is on mid- over sub-bass. However, the bass extension is good, with a natural decay. At times I pondered if it leaned towards boominess, but I’ll give it the benefit of the doubt for now. Much like Utopia, the XC has a neutral vocal position with average density, although its vocal size is a bit larger. In terms of tone, the XC is surprisingly neutral, despite the enhanced mid-bass – a lower treble peak serves to counter the warmth, and balance the tone. So overall, the emphasis remains closer to neutral than natural. The lower treble provides an articulated presentation of its notes, that remains on the right side of smoothness, albeit by a marginal amount – with this pairing at least. And as it has less upper treble emphasis than Utopia, its timbre is slightly more accurate. That being said, I wouldn’t classify it as particularly accurate in timbre or natural. Both the enhanced bass and lower treble peak are defining characteristics, that demand most of the attention. Overall, it left me with mixed feelings as I was hoping to get a taste of the renowned Audeze naturalness, but was left wanting. Next, I moved on to its primary in-store competitor, the Ether closed. Again, one of the first things to jump out is the bass. The Ether provides a solid ‘thump’ down low, and is clearly boosted within the presentation. It’s an ever-present bass, although I didn’t find it particularly bothersome. Nevertheless, it isn’t the bass that impresses – it’s its vocals. The Ether has a nice bump in its midrange, resulting in slightly forward and solidified vocals. This is a truly captivating vocal presentation; bodied, and lightly warm in tone. The bass is again matched by a slight lower treble peak, although it is executed in a more sophisticated manner. It improves the articulation of its notes, but refrains from being dominant within the sound. And just as with the XC, it balances the warmth of the bass, resulting in a fairly neutral tone. I would say the treble integration is better in the signature, resulting in a smoother and more coherent signature. The downside is that its stage feels significantly smaller compared to the LCD-XC. The LCD-XC has a more treble-oriented signature, which helps to create a wider stage. The Ether-C in turn is not only smoother, but relatively more accurate in tone. In addition, its vocals are greater in presence, with those of the LCD-XC sounding more laid-back. Ah, there it is. A fine moment to drench in all the good stuff that made Audeze famous. Smooth, and lightly warm in tone. And what instantly struck me most, was the coherency of the sound: the LCD-2 really manages to present a unified sound, that wonderfully blends together. The bass, midrange, and treble, all working together in perfect harmony. Its bass is tight, quick, yet sufficiently impactful, and I much preferred it over the XC. Its notes are less articulated than the previous two, so therefore might be viewed as less exciting perhaps. But it just fits within what it’s trying to achieve. Its vocal presentation is slightly forward, creating both denser and more bodied vocals compared to its peers. And as some of you may know, putting the midrange in the spotlight is the key to this reviewer’s heart. Even so, all of the LCD-2 pleasantness comes with a drop in transparency. It’s a pleasing sound, smooth, and engaging. But it is veiled. Nevertheless, the pleasure of making my acquaintance with such a classic was all mine. *The LCD-2 is currently being offered as a sort of budget edition, that excludes the fazor tech, large carrying case, and has regular plastic cups instead of bamboo. I have no idea how the original version sounds, but suspect there will be differences here and there. The open Ether has a lightly warm tone, and seems to be a nice execution of neutral/natural. There is a slight lift in its lower treble, but again more successfully incorporated than the LCD-XC, being more similar to its closed counterpart. As a result, its note articulation is slightly clearer than the LCD-2C, though not to the extent of the LCD-XC, effectively placing it between the two Audeze’s. The Ether again has a neutral vocal placement in terms of forwardness and size, although its density seemed to be a bit better than the Utopia and XC. However, I preferred the meatier vocal presentation of the LCD-2, as well as its bass, as its mid-bass was higher in definition. Even so, I found the Ether overall a step up from the LCD-2. They both strive for a similar type of sound, but the Ether is more transparent and technically capable. As it is neither particularly warm nor bright, it functions as a versatile allrounder that works well for instrument-based music, due to its relatively accurate timbre. Add a nice open stage and coherent signature, and it sums up to a complete package. To be completely honest, I was under the impression you had to be over 60 years to appreciate Grado. Chalk it up to stereotypes and ignorance. So imagine my surprise when I found the Grado one of the best sounding HPs. Don’t get me wrong, I see how people can find the bass lacking. In terms of quantity and impact, this isn’t going to impress anybody. It’s a neutral bass by any definition, resulting in a somewhat nimble size of its instruments. Its notes don’t seem to carry a lot of weight, and are placed airily within the stage. But dear god, that instant smoothness that welcomes you. The perfectly coherent signature, and more than anything, the exceedingly natural tone. And despite its warmer tone, a transparent midrange – the advantage of an attenuated bass. Even so, the Grado lacks a bit of upper mid presence. So it doesn’t achieve a similar level of vocal naturalness and engagement as say, an LCD-2. But even though it’s a lighter and somewhat delicate presentation, it’s well thought out and just seems to work by relying on naturalness and coherency. Overall, it does have a bit of an ‘old man vibe’ to it, which I seem to like more than the flinkenick of three years ago would have been comfortable to admit. Another first meet with a modern classic – or, again, revised version thereof. I braced myself for a brighter, more clarity-oriented signature that the original seemed to be known for, but there seemed to be hardly any of trace brightness to be found. So upon first listen, I instantly liked it. My first thought was good stuff, this headphone is going places. A coherent signature, with a near-perfect execution of neutral. This is pretty much how I would expect a prototypical solid headphone should sound – close to neutral, inoffensive, and an all-round signature. But upon further listen, it failed to get me completely hooked. The main issue was the somewhat laid-back vocals. They’re not necessarily thin, but are positioned too distant to get me captivated. It feels they’re right at the rear of the stage, calling out from the back. In addition, the bass seemed a bit shy. In fact, I didn’t really notice it while listening, so I only later realised I didn’t get to analyze its qualities. And while the signature is versatile, it doesn’t necessarily excel in any particular direction. With the sidenote that this is undoubtedly also at least partially due to the specific pairing with the Burson V2. I imagine the HD800s serves as a blank slate, to be configured with dac/amps to one’s liking. Hifisolutions.nl is a registered Dutch dealer for brands as Focal, Audeze, 64 Audio, Empire Ears, EarSonics, Campfire, and Effect Audio. However, where applicable they ship throughout Europe.